UK based The Book Depository is well known for their international book sales and friendly shipping policy, but one thing that they're not quite so well known for is ebooks. This ebookstore launched in April of 2010,but it doesn't appear to have amounted to much. It was hardly even mentioned by most when Amazon bought TBD in July of 2011, and even I forgot that they had an ebookstore. But that doesn't matter anymore. They announced today that they're pulling out of the ebook market. 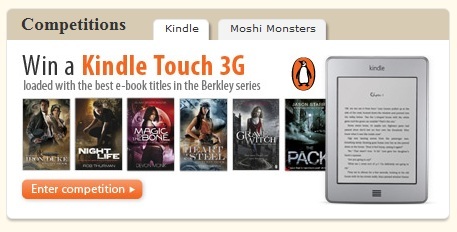 As of 1 July, they'll be turning off their ebook servers and abandoning the market to their corporate parent, Amazon. If you have bought ebooks there you're going to need to download them before the end of the month. TBD won't make any guarantees on whether the ebooks will be there the day after. In fact, their ebookstore is already dead. I just checked and that section of the website has already been disabled. Do you know what they replaced it with? Nothing, really; as I said the ebook sales are being left to the UK Kindle Store. But TBD is also throwing a contest at the moment. The prize is a Kindle Touch. We are contacting you in relation to your eBook purchase which was purchased on 24/08/2011. We have spotted that you still have 1 download(s) remaining. Each eBook purchased will have 3 downloads allotted. If you do not wish to use the remaining available downloads, you do not need to take any action, and eBook facility will be removed from your account on the 1st July 2012. Please note that we are unable to refund eBook purchases where the customer has previously accessed one or more of their downloads. Glad they’re closing down their ebook store and concentrating on paper books, which is their reason of being.